What is the People’s Climate Movement? The People’s Climate March on Sept. 21, 2014 signaled to both U.S. and global leaders that large numbers of people in the United States cared about the climate crisis. Not only was the march the largest action on climate in history, but we successfully changed the notion that climate change was just an environmental issue. The march made it clear that this is also a social and economic justice struggle. Building off of the energy and success of the march, the People’s Climate Movement was formed to continue to build on that energy and excitement and expand across the country. This fall, front-line communities impacted by the environmental crisis and climate change, are joining with workers, people of faith, students, immigrants, racial, climate and economic justice activists and other community members, to call for bold action on climate at the local, national and global levels. Last year, the People’s Climate March included more than 2,000 events in over 150 countries. New York City alone had over 400,000 people marching. Meanwhile Miami – in spite of already feeling the effects of sea-level rise – had a group of only around 100. This year, with the combined efforts of more than 50 local organizations and elected officials, I hope to see 10 times that number. It’s time our communities and government came together to prepare for the impact of climate on our homes, neighborhoods, livelihoods & health. Join our growing movement as we build power and demand real climate action from every level of government. 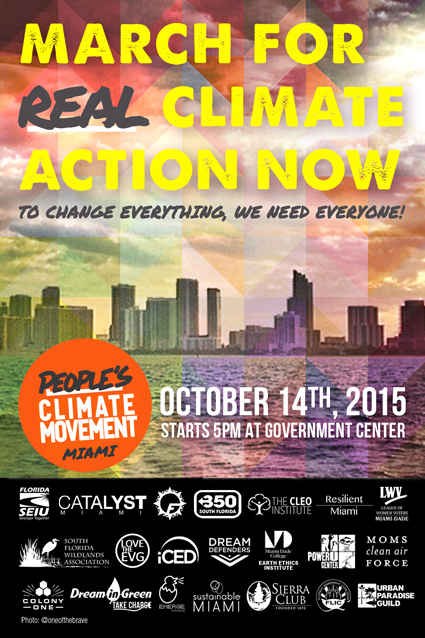 Help make this the biggest climate justice event in Miami’s history. Sign up & invite everyone! When: Wednesday, October 14, 5 p.m. The Seas Are Rising. So MUST We.